We welcome our guests with disabilities to the Poway Rodeo! Parking for guests with disabilities ($10.00) and a separate entrance are located at the south end of the grounds. A.D.A. seating is located at the southeast end of the arena. These grandstands are fitted with wheelchair-accessible ramps, and seats are elevated for a great view of all the action! A.D.A. service dogs are allowed in this area, and wheelchair-accessible restrooms are located near these seats. This special seating area will accommodate one (1) disabled guest accompanied by one (1) companion. Please contact us if you require additional seats. 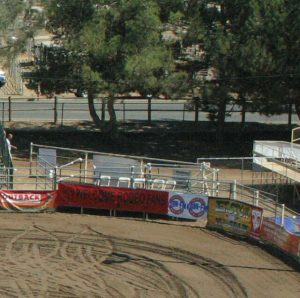 The Poway Rodeo Committee intends to comply with all regulations and accessibility requirements of the Americans With Disabilities Act. Guests with disabilities may receive assistance during the event as necessary from Rodeo volunteers (wearing red vests) or Committee Members in Poway Rodeo shirts. ANY QUESTIONS? Use the Contact Us form below or call 1-866-PRORODEO.